We're having a wonderful time here at the Gazette preparing for Halloween and making some pretty fall accent pieces to brighten up the exterior of any dollhouse. The best time we're having is a way of marking time! Charlene joins us this month with a tutorial for a working hourglass that is sure to be the pride of any witch, wizard or sorcerer. And yes, you read that sentence correctly. This hourglass really works!! I can't wait to give this a try and make my own. It's perfect for any witchy Halloween scene, but this fascinating piece would be just as delightful in almost any mini home. We also have some fun autumn fashions for the exterior of your dollhouse. Wait till you see the secret component of this picket fence window box! Not only will it enhance any dollhouse exterior but I'll bet that it will get you to thinking about other ways you can use this mystery mini. 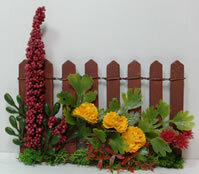 To finish things off, we have a tutorial for a coordinating picket fence in pretty autumn colors. Oh, did I forget to mention that Charlene is also our Member of the Month? Not only will you learn how to make one of the coolest minis I've seen in a long time, but you'll also get to know Charlene and see a little more of her miniature art. Have a happy and safe Halloween! And don't forget to treat yourself this year with a special dollhouse just for fun. 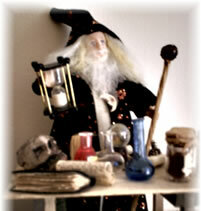 Every wizard and witch needs an hourglass so as to not over-or-under-cook spells and brews. Admit it, your haunted house cries out for one. But if you can find a working hourglass in scale, it will be very expensive and possibly threaten the mortgage payment. What's a mini enchantress to do? Well, here's an easy way to create one that actually works. The directions and supplies are for the easiest assembly, but I did several versions and it's a cinch to personalize - try wood or metal instead of mat board and turned cocktail picks, straight silver or gold jewelry pins or floral wire instead of coiling rods. Make the stand round, square, star or moon shaped. Before you know it, you'll have the perfect, unique accent for your fantasy scene. 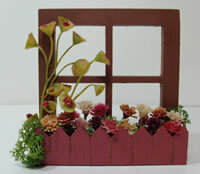 You'll be amazed at how this adorable picket fence window box is made. It's definitely an 'outside-the-box' technique! It's also easy to make and extremely affordable. If you'd love to give your dollhouse windows a unique exterior design for autumn (or any other time of the year), come with me and we'll show you how. After creating a picket fence window box (see the previous article in this issue of the Gazette), it occurred to me that coordinating a real picket fence for the landscaping would give any dollhouse a little extra elegance. This coordinating look pulls the house and the yard together into one gorgeous unit. 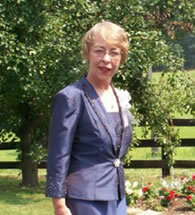 Member of the Month - Meet Charlene! At least that's what Gizmo thinks! With his big yellow eyes and magnificent tail, Gizmo would be right at home silhouetted against a full moon on Halloween night. Thanks to Jeanne for sharing such a wonderful picture with us. 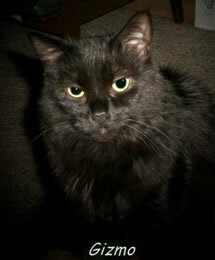 She and Gizmo will be receiving a $25 gift certificate from Petsmart for being featured in this month's critter corner. If you'd like to submit your pet's picture for consideration for the Critter Corner, you can upload pictures in the "Good Pets acting bad!" or "Good Pets acting cute!" galleries at the Greenleaf Forum.